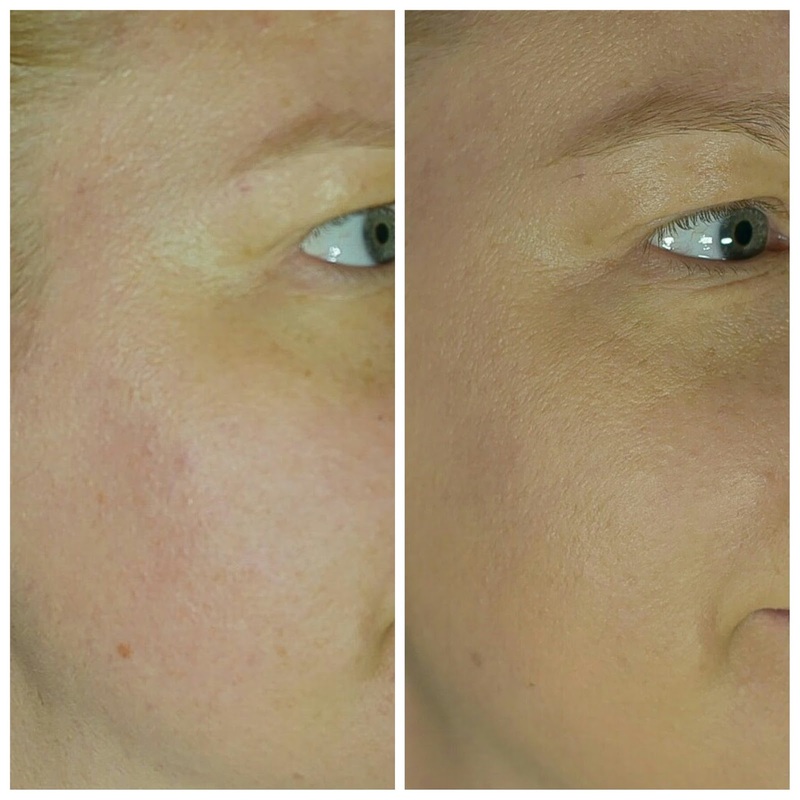 I'm not sure what has happened to my skin but it has changed in my 30's. Maybe it's the two pregnancies, the breastfeeding, sleepless nights, or just gravity in general. I have always had combination skin, but now it's more even, less oily, and just seems healthier. However, I'm seeing the beginnings of lines around my eyes and my forehead. I keep reassuring myself, this is normal and my lines are from laughing. I kept that all in mind when hunting for the perfect foundation. I wanted to make sure that if I drop $40 on a new foundation, it better meet all (or at least most) of my needs. 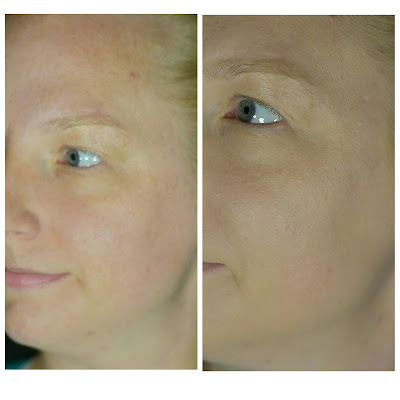 I needed a foundation that looks very natural while still smoothing out my fine lines and wrinkles. I'm a stay at home mom that likes to wear makeup daily, but I need it to look natural and I want it to protect my face. 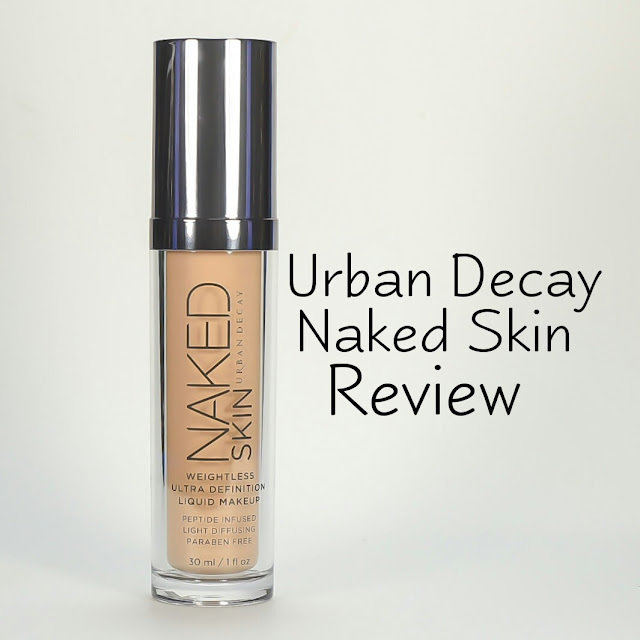 Urban Decay Naked Skin does a really good job of giving a medium coverage. My freckles still peek through but it still covers. 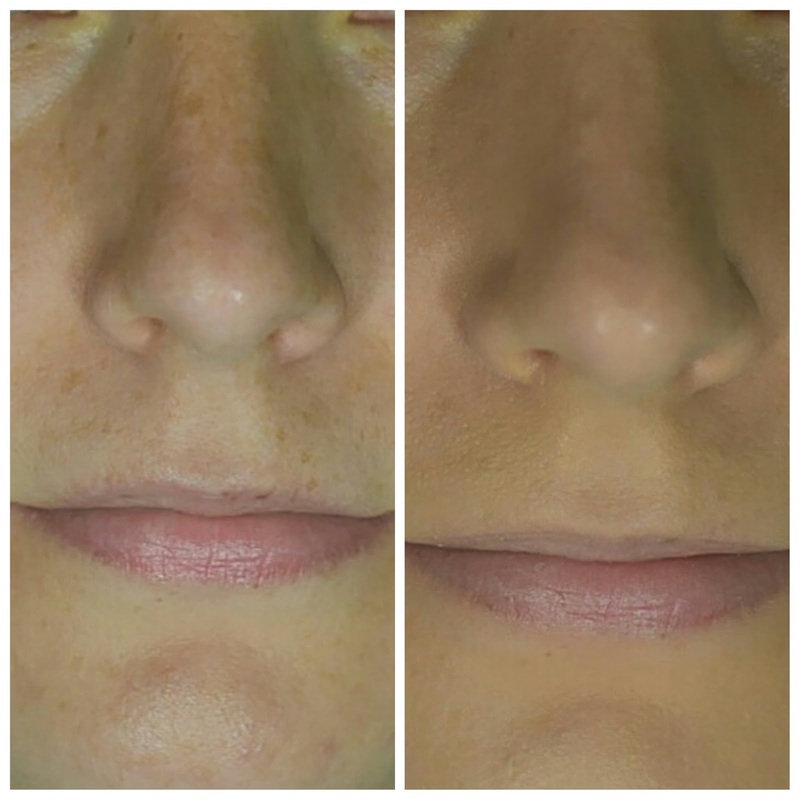 On the left, my skin is clean and prepped. On the right, I have applied the foundation with the Real Techniques Expert Face Brush. I really love the finish of this. It's not too matte but not too dewy. I just gives my face that, here's my face but better, look. My anxiety kicked into overdrive when I saw the picture on the left. I convinced myself that the yellow was from liver failure from all that alcohol I drank in college....or after college. Then I returned to my senses and quit googling "what causes yellow skin around eyes." I'm fine. I'm fine. No need to panic. I have been using this daily for about two weeks now. It stays on all day and doesn't settle in my lines. It blends incredibly well. It feels very light and really does make my skin feel "naked." I wear it during my workouts. I even tested it out when we went boating. I applied it over my sunscreen and it performed really well out on the boat. So now that you know why Urban Decay Naked Skin Foundation is my new go to foundation, let's talk about the one thing that I do not like. There isn't any SPF in this foundation. My previous foundation only had a minimal amount of SPF (15). Even though there wasn't a lot of protection in my previous foundation, it still made my mind at ease there was something in there. I'm on the hunt for a good sunscreen to use under my foundation. That is my new goal in my makeup life. It is so important to protect your face and body. I have had three pre-cancerous moles removed because of not protecting myself. I don't want any scars on my face from removing pre-cancerous moles like I do my body. I'm leaning toward Benefit Dream Screen Sunscreen for Face. I'm also hoping that I can reapply it over my foundation throughout the day and it doesn't ruin my makeup. I'll let you guys know how it works after I buy it and test it. I bought Urban Decay Naked Skin from Ulta for $40. It is definitely worth the price and I'm very happy with my purchase! Aqua (Water/Eau), Cyclopentasiloxane, Butylene Glycol, Silica, Cyclohexasiloxane, Dimethicone, PEG/PPG-18/18 Dimethicone, Sodium Chloride, Camellia Oleifera Leaf Extract, Litchi Chinensis Pericarp Extract, Tocopheryl Acetate, Tetrahexyldecyl Ascorbate, Tribehenin, Palmitoyl Oligopeptide, Palmitoyl Tetrapeptide-7, Sodium Hyaluronate, Glycerin, Dimethicone/PEG-10/15 Crosspolymer, Dimethicone/Polyglycerin-3 Crosspolymer, Isopropyl Titanium Triisostearate, Polysorbate 20, Disodium Cocoyl Glutamate, Sodium Cocoyl Glutamate, Propylene Glycol, Carbomer, Cetyl PEG/PPG-10/1 Dimethicone, Hexyl Laurate, Polyglyceryl-4 Isostearate, Caprylyl Glycol, Phenoxyethanol. May Contain: CI 77891 (Titanium Dioxide), CI 77491/77492/77499 (Iron Oxides). This looks so natural! I rarely wear make up at home, but the rare occassions I do get to go out I want my make up to be spot on. It is very natural. I love it! I love how natural this looks on you! Makeup is one of my other loves! I was that way. Now I'm buying less and less nail polish and getting more into makeup. 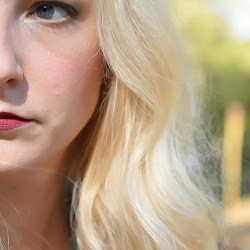 I was always into makeup, but I didn't really blog as much as nail polish. This looks so natural. I've been hunting for the perfect one for me but haven't found it yet. I'm glad I found one for me. I hope you have luck finding one! Very cool. Great review. <3 I don't wear foundation on a daily or regular basis but I will have to check this out. I LOVE anything Urban Decay pretty much. It's such an AWESOME brand!! I need to try this!! Agreed. 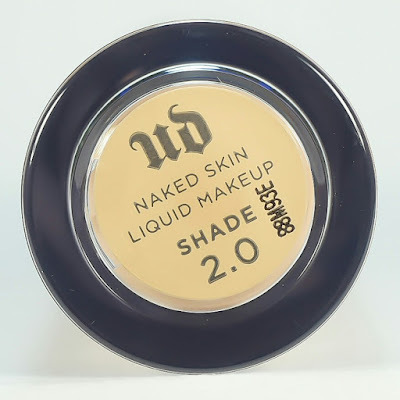 Urban Decay is really fantastic! Oh god, never consult Dr. Google about anything health related! I've been on the hunt for the perfect skin care products since mine changed so much for all the same reasons as you! Dr. Google really freaks me out sometimes. It's looks like a great foundation! This looks great on you! I'm searching for a new foundation, too. I need to hunt down a sample of this. Ooh this looks like it has such great coverage. I'll have to try it out I've been getting more and more into makeup.